TGIF-It's Friday! :) And if you are like me you are still get used to the time change. Who would think 1 hour can create so much havoc? But it does! 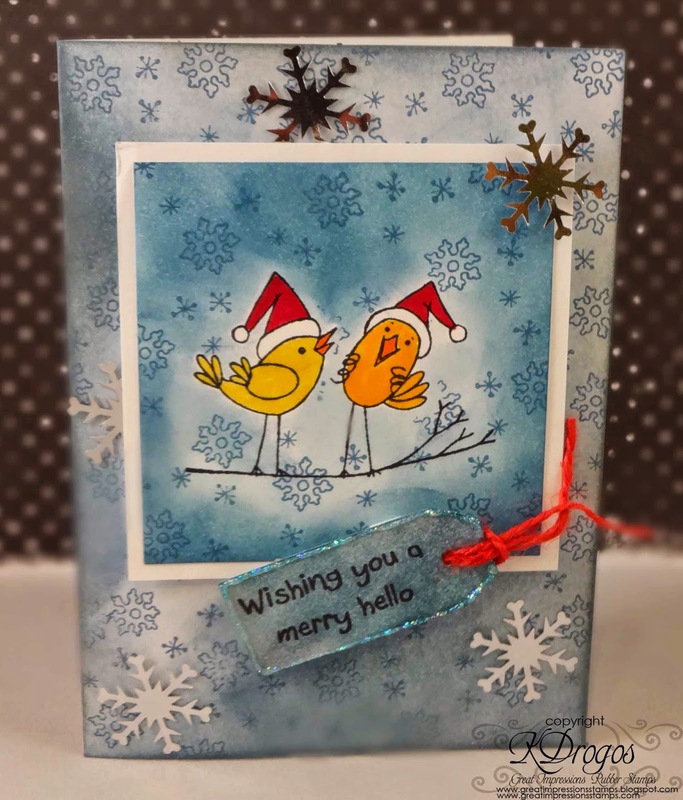 I used the following stamps: A71 Snowflake Cluster, A117 Merry Hello, and E815 Singing Birds. I used Tim Holtz's Faded Blue Jeans Distress Ink for the snowflakes and inked on the paper. Both the background and focal square were done using the same ink. The one in the middle I used more ink and layered it on. For the birds I stamped them and then made another stamp that I cut out and used as a mask. For the tag I used Star Dust Stickles around the edges. I love this sentiment! So sweet! The snowflakes were from my stash. Maybe a confetti? I don't know but I still have a lot of them-LOL! Thank you for stopping by today! Be sure to check out our Facebook Page and Pinterest Boards for more inspiration. And be sure to link up to our current challenge: Thankful Thoughts. Beautiful!! LOVING the snowflakes and the adorable birdies!!!! !